Where has my littlest boy gone? The chubby cheeks, arms and legs, the be-dimpled smile, the kissable lips, the adorable eyes... I could go on and on and on like a mad mama who can never get enough of her child's cuteness. The happy "little guy" as baptised by his jie jie grew before my very eyes everyday but I still wonder, how could time fly too fast? In just 3 months time, my baby will turn 2 years old officially. Yes, I said officially because baby G is actually quite big for his size that he was often mistaken older than his actual age. He is very fascinated with numbers that at 20 months, he can already count 1 to 10. His vocabulary has improved a lot in the past few months. He can now identify a lot of things from his picture dictionary and he can now identify 90% of the letters from the alphabet. His love for books didn't stop from just reading flipping them. He also uses them as a track for his cars and/or for himself. He normally lines them up, get his cars and guide his cars run through the books. Without the cars, he'll step on them one by one whilst counting 1 to 10. How's adorable! He gets bored with his toys quite easily. He will only cling to his favourite toy for a day or two and totally ignore it after. Good things almost all his toys are bought from a goodwill store. He still hates toothbrushing so I normally leave the toothbrush for him to play in his mouth to get used to it. Look how he was hanging by the bed while playing with his toothbrush. Too cute for words. 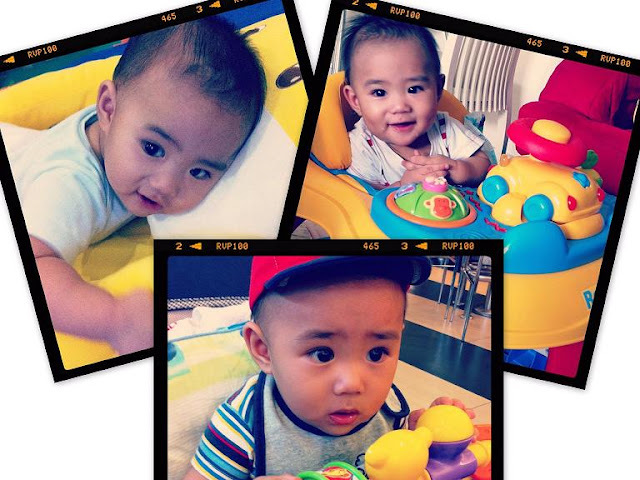 My precious G, please don't grow up too fast otherwise Dada and jie jie will start bugging Mama to "make" another baby. Haha. Seriously, let mama savour the rest of your babyhood. Mama still enjoys how you kiss her like there's no other woman in your world. I love you, my baby boyie. We all love you so dearly. Thank you for bringing so much joy and profound happiness in our lives. Happy 21st month! Wow, smart kid you have, enjoy it sis while he's young before you know it he's a grown up already and won't come tagging along anymore. dropping by. He can manage well with his activities. I love seeing the books aligned by baby G.
I am famous now in the Internet. Seems a lad ahead of his age. Good thing he can prounce na the letter R. Mahirap sa 2-year old lad yun. BTW, cute photos. 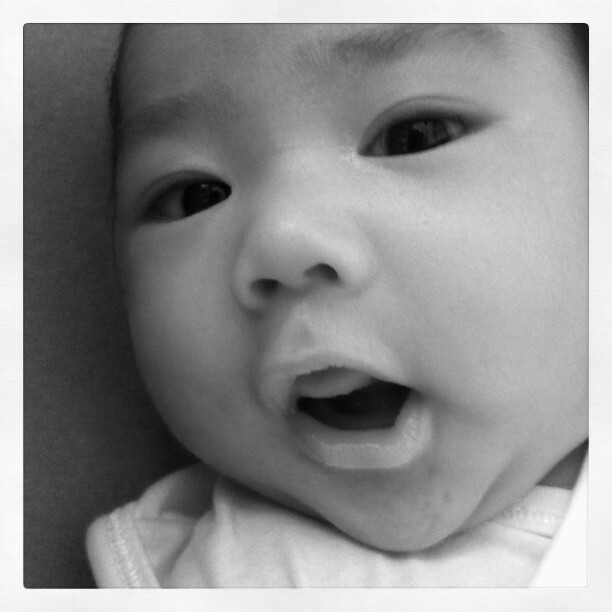 those are cute words in his own language.I miss this stage of the child.I don't blame you if you want another one. Having a baby's around make us young and the happiness they brought is happiness, indeed. 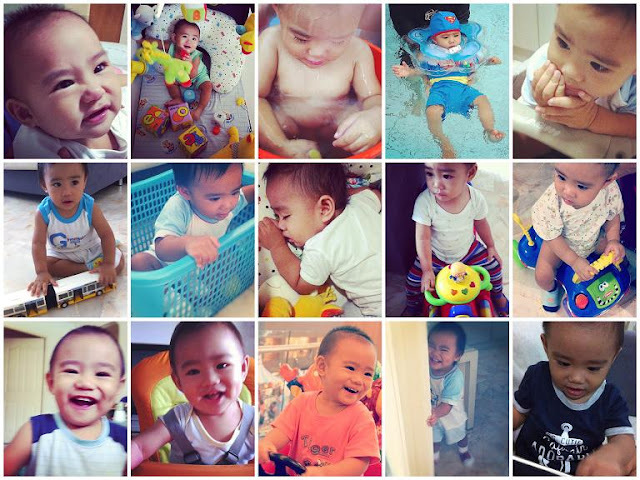 here, again Che, can't get enough of baby G, thanks for sharing your happiness with us, it is so heartwarming reading his progress and seeing his pictures as he continually to grow. Kids grow up very fast that we, as Moms, tried our very best to hold on their childhood. He is a very handsome young man sis and smart pa! Baby G is growing clever and handsome. I am pleased with kids who have their ways to make their parents happy. Baby G is showing many positive attributes that will definitely make you proud mommy Che. hello baby g... you are so cute. way to go! he's just so adorable. i'm s taring to miss my son tuloy as i am now working and lives on a different house..
he's growing as a smart little man, love to read how he identify things on his own way...clever! :) happy 21 months Baby G. :) sis, i am sure...he will make you proud. oh, btw...he is so cute.